A streaming music subscription is one of the better ways to spend 10 bucks per month but if you happen to have multiple family members living under one roof that all enjoy music, that incremental fee can quickly turn into a serious budget buster. Fortunately, Google's latest product is one that the whole family can enjoy. You'll soon be able to sign up for a Google Play Music family plan that offers simultaneous listening for up to six people. It's priced at just $14.99 per month, far cheaper than it'd be if you were to pay for individual accounts for just two or more users. Google says its family plan offers listeners the same ad-free experience that you'd get with a standalone account which includes access to more than 35 million tracks. What's more, each family member will have their own playlists and favorites so you won't be subjected to others' tunes. As an added bonus, Google Play Music family plans also include YouTube Red which, if you recall, eliminates all YouTube ads and even allows for offline viewing. With its new family plan, Google is matching the offer Apple introduced with Apple Music earlier this year. 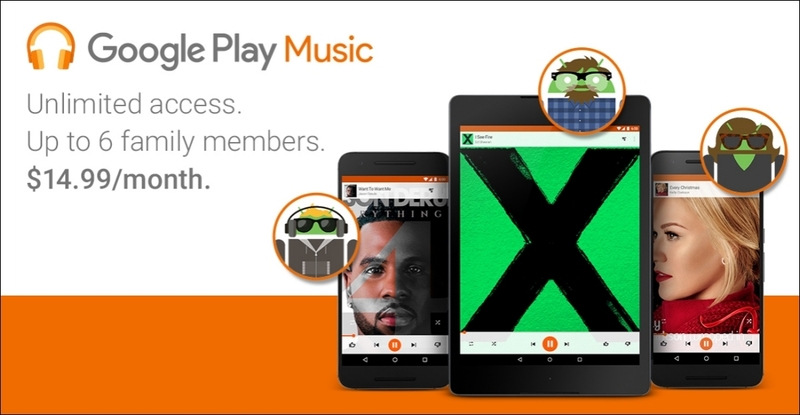 Google said you'll be able to sign up for the Google Play Music family plan in the coming days on Android devices in the US, Canada, the UK, Australia, France and Germany with more countries to be added in the near future. You'll also be able to listen on iOS devices and the web, we're told.